Miura has to wait another day, because today the results of the Pebble Beach Concours are revealed! So, sit back and enjoy! The weather was fine, the people were great and of course the cars, or better say automobiles, were grandiose… as always! The judges have chosen their Best of Show, Best of Show Nominees, Most Elegant Awards Winners, Special Awards Winners and Class Winners. HERE is the complete list of all the 2015 Winner. Best of Show this year was again one of those great European marques from the past, Isotta Fraschini, with the grand 1924 Tipo 8A with coachwork by F. Ramseier & Cie of Worblaufen, Switzerland. When this automobile was sold at the Artcurial auction at Retromobile in February 2014 and bought by parties which included Rob Myers, chairman and founder of RM, it was obvious that it was going to be prepared as a Best of Show contender at Pebble Beach… Much will be written in the coming period about this car, but what almost nobody will know is how this striking automobile was unearthed in the early 1960s in southern France by dealer Yves Dalmier from Toulouse. Yves has written a splendid book about his car chases, titled Les Roues de Fortune, Les Roues de Misère, published in 1991, like me : P The whole story about the find of the Isotta is told in two chapters. 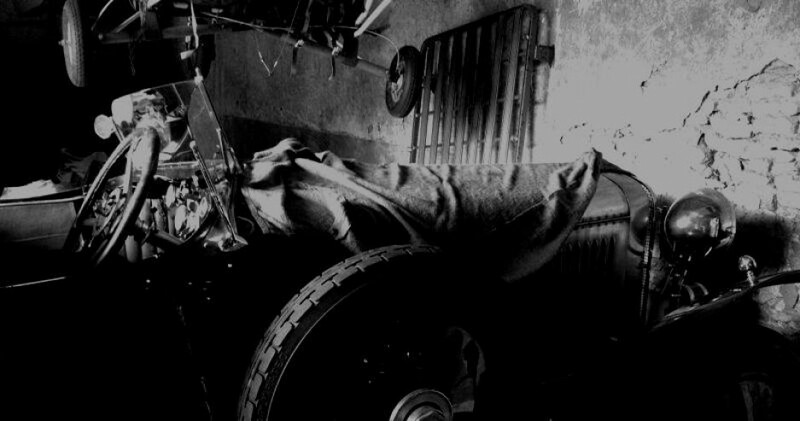 Unfortunately for the readers of CHB it is only available in French, but those who can read French will enjoy reading Yves’ very entertaining stories about his car finds, of which many Bugattis! So now you know which book to grab when you are at Retromobile or perhaps somewhere online! Yves found the Isotta in the most mundane way of simply putting up an ad in a local paper. Soon a plain letter came in from someone at Carcassone who told him he had an Isotta for sale for 1,000 FF. You can imagine what must have gone through Yves after having read this and he duly went to the drugstore at Carcassone to inspect the car, a car of his dreams. Apparently the couple had difficulty finding tires of the proper size for the car and had decided to sell. Isn’t it amazing how such local shops, like a butcher shop (remember the article about the 500K butcher’s car) or in this case a drugstore can hide the most fantastic treasures! Interestingly Yves also recounts in his book his experiences as a driver of the car. He recorded it being a Tipo 8AS. With the top down the top speed attained during a rally on a stretch of Italian highway was 135-140 km/h on the speedo. Average speed was more modest, 85 km/h, mostly because above 100 km/h the car became extremely difficult to handle. At speeds up to 100 km/h the car handled well, although like a fully loaded truck. During the 12,000 km that Yves drove the car consumption was no less than 18-25 liters/100km. Yves owned the Isotta for six years before he sold it to that great French collector Albert Prost from Roanne, from whose estate it was sold at auction in 2014. One other fine automobile, that won a Special Award at Pebble Beach this year, needs mentioning here because my dad and I has such close ties with this particular car, just love it… magnificent! Last year this great Hispano won the Best of Show at Concours d’Elegance Paleis het Loo, below a pic from this event. It is the smashing 1929 Hispano-Suiza H6B Hibbard et Darrin Cabriolet de Ville of his friend Hans Hulsbergen from Switzerland, who won the coveted Alec Ulmann Trophy – a well deserved award for automobile as well as its owner and chauffeur Fred (this Hispano is always chauffeur-driven). Tomorrow we jump into the world of Lamborghini, look forward to it!